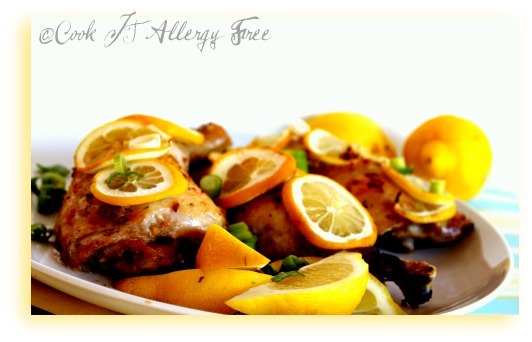 Easiest Gluten Free Meyer Lemon Roasted Chicken Recipe Ever! Have you heard of a Meyer Lemon? Do you happen to know the difference between it and a regular lemon? Well, apparently, the Meyer Lemon is a cross between a true lemon and a mandarin orange. It is more golden in color. It is slightly sweeter and not nearly as acidic as a regular lemon. They are only available in winter through spring. So if you can get your hands on some of these babies, do it. They are a delicious citrus hybrid. A subtle lemon affair in your mouth, without the awful pucker. I usually pounce on these at the market when I see them. However, if you cannot find them in your neck of the woods, combining the juice of a lemon and a mandarin orange will give you the same effect, for the most part. I have used these lemons in both savory and sweet dishes. I will share with you, today, a savory concoction involving this mellowed out lemon friend. One of my favorite kind of meals to make is the kind that I can throw into the oven and forget about for a bit. It gives me time to clean up the dinner prep mess. Help kids with homework. Fold a load of laundry. Sip a glass of wine. Take a bubble bath…(okay, the bubble bath never happens). And, because in about three short months it is going to be too hot here in Arizona to keep the oven on for long periods of time without heating up the house, I must take advantage of these types of recipes now. As soon as the temperature soars to the one hundred degree mark, my husband officially bans me from pressing that pretty little “Bake” button on my oven. Instead, he will be insisting on taking full advantage of his fancy new grill that he just built in the backyard. So, with only six ingredients, this truly is the Easiest Gluten Free Meyer Lemon Roasted Chicken Recipe. It comes together in no time and it is a hands-down kid favorite in our house. It is also perfect if you are dealing with food allergies – it is gluten free, dairy free, egg free, nut free, soy free. And because the Meyer Lemons add such a nice burst of citrus to the skin and the meat of the chicken, you may just find it really hard to resist eating all of that finger-licking crispy skin. 1. Preheat oven to 400 degrees. Line a baking sheet with parchment paper. 2. Squeeze the juice from one of your lemons into small bowl. Add Olive Oil, Sea Salt, Minced Garlic, and Italian Seasoning to bowl and mix together to form a paste. 3. Slice second lemon into thin rounds. Pat Chicken Leg Quarters dry. Place on prepared baking sheet. 4. Gently slide fingers under skin of chicken legs and separate from the meat, taking care not to tear the skin. Add a spoonful of the Olive Oil mixture from step 2 under the skin and massage from the outside to spread mixture underneath. Then, slide 1 – 2 sliced lemon rounds under the skin. Repeat on all four of your leg quarters. 5. Spread remaining Olive Oil mixture evenly over the top of the skin of each Leg Quarter. Place in preheated oven and bake for 30 minutes. 6. Remove pan from oven and place 2 slices of the thin lemon rounds on top of each piece of chicken. Place pan back in oven and continue cooking for 15 – 20 minutes longer, or until internal temperature of meat reaches 170 degrees. 7. Cut third lemon into wedges and serve as a garnish with the chicken. Note: This chicken goes especially well with this Vegan Asparagus Leek Risotto from the Gluten-Free Goddess. I add the zest from these lemons to the risotto for a nice garnish and tie-in to the chicken. Oh, I love Meyer lemons! 🙂 What a great idea to use it with chicken, Kim. I saw some Meyer lemons a while back (a really good deal, too, and they were in netted bags), I know about scooping them up – they go so quickly! Hi Zoe!! The Meyer Lemons really give this a good flavor, but regular lemons totally will work just fine, too!! 😉 I wish these were around longer though! I really like the flavor of them so much better! I’ve never heard of a Meyer lemon but I certainly will keep my eyes peeled for them now! I love cooking with lemons and oranges and I’m looking forward to tasting these ones that reduce the “pucker” effect that lemons can give. Thanks for the valuable info! I’ve never seen a meyer lemon here, but your picture is just beautiful! I’m just happy to find regular lemons on sale. 🙂 And this chicken looks delicious, something that I know my whole family would love. Hi Jeanine! Thanks so much! Living in AZ, we have an abundance of citrus. It is literally dropping off the trees and people leave bags of it in their driveways with big FREE signs. I find that I end up cooking quite a bit with the lemons and oranges, especially at this time of year! Beautiful looking lemons! I’m on the lookout – I have a craving for lemon poppyseed loaf so these will be needed! Sounds like your husband his quite the playground at your house 🙂 Lucky boy! Stunning photos, adorable post, and I want some of that chicken!! Now that I’ve visited you, I can envision your dear hubby in the back grilling. 🙂 It always makes me so sad when it’s too hot to bake. Very, very sad. And I am so so with you. It is such a sad day when the heat index reaches the “DO NOT TURN YOUR OVEN OR YOU WILL PAY” point. Hi Priyanka! Welcome and Thank you so much for the kind words about my blog! I am so glad you like it! 😉 Hope to keep seeing you here! Oh my goodness, my mouth is watering Kim! This is definitely going on my menu plan for next week. Can Kurt come over to my house and build me a fancy new outdoor grill? 😀 We’re actually thinking of getting an outdoor wood-fired pizza oven. My thinking is that if we can’t eat out, then you gotta bring the restaurant flair to your house, LOL! Now if I can only get my hubby interested in cooking more often! Miss you! I had such a fun time with you and Mike this weekend. Tell Mike he has earned himself rockstar status after putting up with all of us this weekend! Oh wow, this looks so lovely. I have a LOT of whole organic chickens in my freezer (Whole Foods had them for like $1.69/lb a while back) and I think I’ll break one down for this recipe. Yum. This looks really good! My husband and I have a whole free-range chicken to use up and I think I might try expanding this recipe to use on it! Yum! Hi Christine! Thanks so much! I have totally done this on whole chickens before, too. It works perfectly, just takes a tad longer in the oven! When I do it this way, I also stuff the inside cavity with lots of the meyer lemon halves and seasonings and garlic cloves! Hope you enjoy it! and though I love it, this is definitely something new I woudl liek to try! Although I have read about Meyer Lemons for a very long time, it is only recently that I’ve been able to get my hands on some. I have, so far, only made desserts with them. I love that you’ve used them with chicken. It looks soooo yummy! Hi Candace! 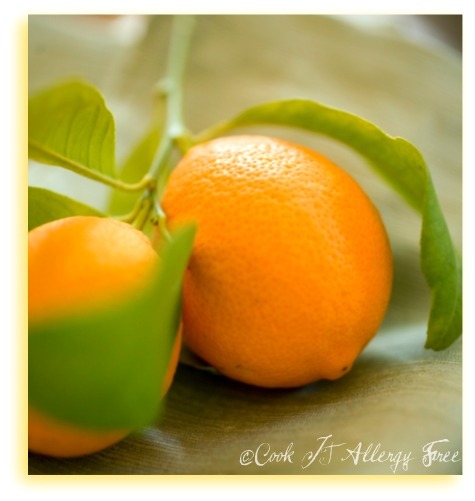 I have used Meyer Lemons in desserts and savory dishes alike! And I just love their less subtle punch! They are definitely a nice touch on this chicken. I love dinners where you can just pop them in the oven and forget about them too. I did just that with my chicken for dinner tonight. Lemon chicken is a common dinner around here, so it will be nice to try something different. Your meyer lemon chicken looks delicious! That sounds tasty. Thanks for sharing it at Real Food Wednesday. Do you mix up your own Italian seasoning or purchase a particular brand? Hi Amber! I usually will use the Simply Organic Italian Seasoning blend. However, whenever I am out of that, I will just throw in a bit of each of basil, oregano, thyme, marjoram, rosemary. Right now, I am using most of those fresh since I have all of them growing in my veggie garden right now. Just stopping by from HearthNSoul. I hadn’t heard of this lemon/orange cross but I will definitely be on the lookout for them now. while I’m here I wanted to invite you to my Iron Chef Challenge which starts tomorrow and the themed ingredient is canned tomatoes. Link up a recipe and you’ll have a chance to win a prize. Hope you can join in the fun!!! I would have never thought to use Meyer lemons when cooking chicken…great idea! I’m really partial to desserts as far as Meyers go so thanks…. Thanks for sharing at the hearth and soul hop last week. Oh yum, yum, yum. I love Meyer lemons and I too pounce on them. I love them with chicken or seafood. I like to cook mine under a brick. Give your hubby one and he can do that on the grill when it hits 100. Dear lord that is hot. I always knew you were one hot mama. Love this recipe!